I have worked on a few other areas outside my main research programs on religion and violence, and religion-state connections. 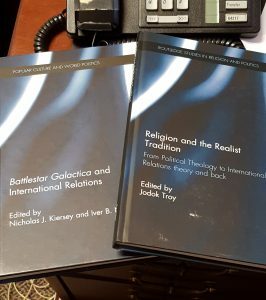 I wrote a co-authored chapter with Daniel H. Nexon (of Georgetown University), Interpret this volume!, in Battlestar Galactica and International Relations, edited by Nicholas J. Kiersey and Iver B. Neumann. We interpret international relations scholars’ analysis of the sci-fi series Battlestar Galactica and discuss what this tells us about contemporary interactions between academia and popular culture.